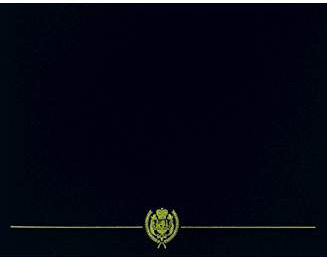 Coast Guard and Navy are Applicable. Or, if the Meritorious Mast is not listed on your DD-214 you must provide your DD-214 - AND - a copy of your Meritorious Mast orders. 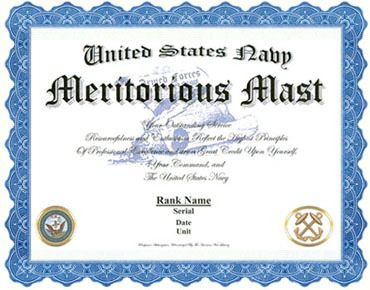 The Meritorious Mast is a formal and ceremonial acknowlegment recognizing an enlisted person being awarded a Letter of Appreciation, Certificate of Commendation, or a personal decoration whenever personal performance is considered noteworthy or commendable beyond the usual requirements of duty by a demonstration of exceptional industry, judgment, or initiative. 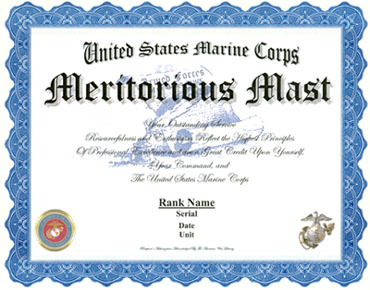 A Meritorious Mast is conducted in exceptional cases of award.